So You Want to Buy A Loom! There are plenty of compelling reasons to take up weaving, but the ones we hear the most often from our customers is that weaving is a great way to use up stashed yarn, and it is also a wonderful kid-friendly activity for the summer break. Whether you are thinking of buying a loom for the first time, or you are looking to upgrade, today's blog post will help you sort through the various types of looms to determine which one is best for your skill level, space requirements, intended usage and cost. By assessing how much room you have for your loom, you can probably narrow down the list of choices right away. A tabletop, backstrap or hand loom are ideal for those with limited space, while a floor loom is better suited to those with a dedicated crafting area. Keep in mind that, while a loom might fit in the intended area, you will want to be sure that you have enough space to work comfortably when setting up and weaving. If you do have enough space, a floor loom is recommended because it is heavier and stronger and works much faster than a table loom. Floor looms offer more project possibilities and also give a better shed because of their greater depth; some models of floor looms are light and can be folded (Jack types), while others are heavier and take up more space. A Folding Rigid Heddle Loom. Starting small can be a wonderful way to get your feet wet without the huge investment a larger, more complex loom would require. Table looms are generally smaller and less expensive than their floor loom counterparts, and they are portable enough for travel and storage. 4-harness (shaft) table looms are also useful for demonstration purposes, samples and workshops; even once you graduate to a larger loom, it can be used later for samples, research and small projects. 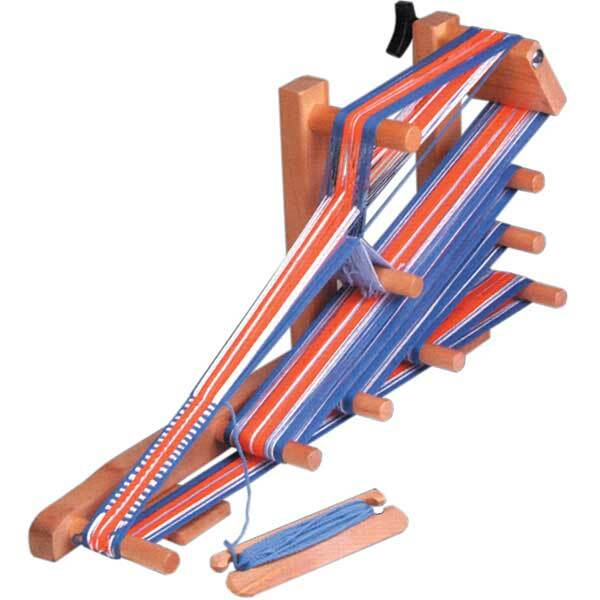 Other looms which are easy to master are inkle looms or rigid heddle looms. Advanced weavers would do well to to purchase a floor loom with as many harnesses (shafts) as possible; the more harnesses a loom has, the more design possibilities it offers. Some looms have as many as sixteen harnesses! A 16 Harness Floor Loom. 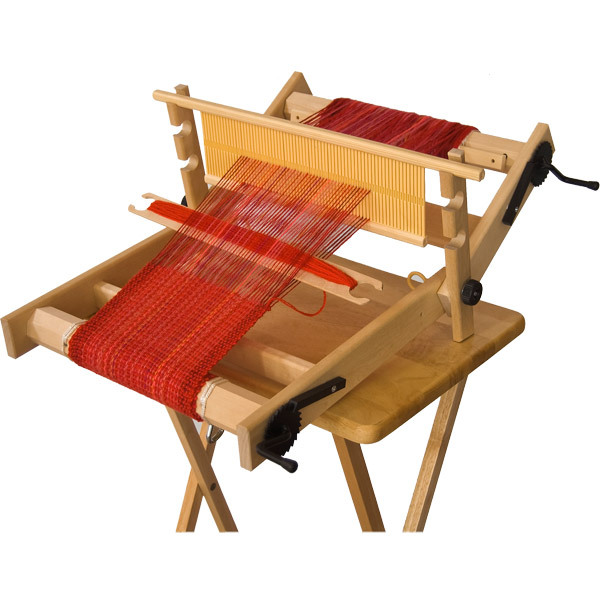 A rigid heddle loom will allow you to weave light work such as placemats, dishtowels, scarves, shawls or fabric for clothing. Tapestry looms are frame looms which do not require a warping board; they are ideal for making a tapestry to hang on the wall. 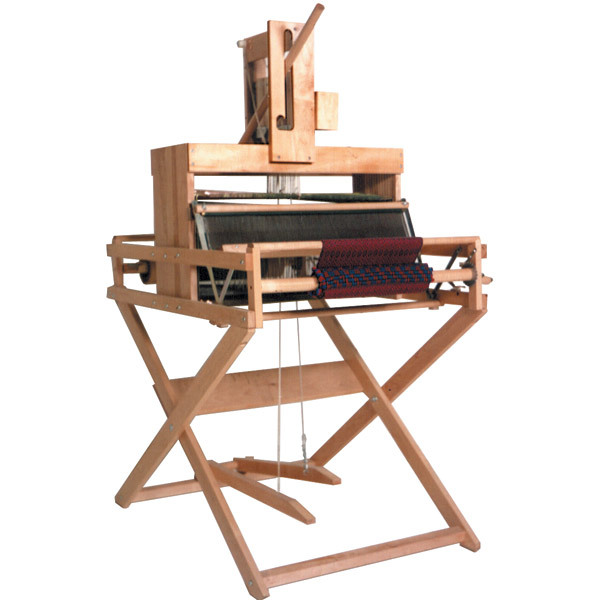 Triangle Looms are also frame looms which do not require a warping board. Because of the resulting triangular shape, tri-looms are ideal to quickly weave triangular shawls (a 7-foot shawl can be woven in less than a day!). Blankets or afghans can be made by piecing several triangles together; other possible projects include mats, scarves, ruanas or ponchos. A general rule of thumb when purchasing a loom is that price goes up with size and features - by determining your budget ahead of time, you will be able to match your other requirements to an appropriate loom. For beginners on a budget, a rigid heddle loom is a good way to learn how to weave without spending too much money, and it is the equivalent of a 2-harness loom. Among 4-harness looms, a table loom is cheaper and can be moved easily, but it is hand-operated and therefore much slower than a floor loom; also, because of its low weight and width, the weaving possibilities are limited. For more information on loom types and features to help you select the best loom to suit your needs, please visit our informational page here on our website.